Obese adults who lose at least 5 percent of their body weight report that they sleep better and longer after six months of weight loss, according to a new study. The results were presented Tuesday at the joint meeting of the International Society of Endocrinology and the Endocrine Society: ICE/ENDO 2014 in Chicago. In addition, the study found that weight loss at 6 months improved sleep quality, as well as mood, regardless of how the individuals lost the weight. The 390 study subjects participated in the Practice-Based Opportunities for Weight Reduction at the University of Pennsylvania (POWER-UP) trial. This 2-year study, funded by the National Institutes of Health, compared three behavioral interventions for weight loss in obese adults treated in primary care practices. Subjects (311 women and 79 men) were randomly assigned to one of three programs that provided varying amounts of support to achieve the same diet and exercise goals. The groups were: (1) usual care, in which subjects received printed educational materials during quarterly visits with their primary care provider; (2) brief lifestyle counseling, which included quarterly visits with their primary care provider, combined with brief meetings with lifestyle coaches; or (3) enhanced brief lifestyle counseling, with meal replacements or weight loss medications added to the second intervention. 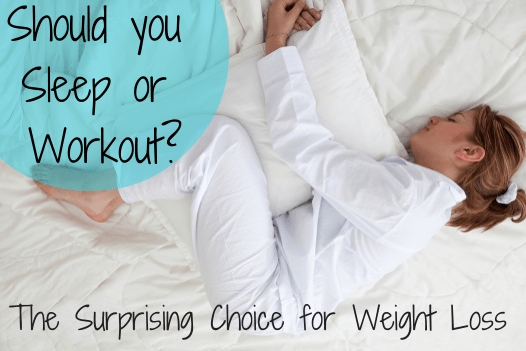 Proper sleep can help you avoid excess weight gain and, over time, lose weight. But if you’re looking to drop 10 pounds by the end of the month, sleep isn’t your answer. You might think that the more hours you’re awake, the more calories you’re burning, so you should be losing more weight. But you’d be wrong. In fact, people who don’t sleep enough at night risk gaining extra pounds, not losing them, according to John M. Jakicic, director of the Physical Activity and Weight Management Research Center at the University of Pittsburgh. Hormones that regulate growth and appetite are part of the equation, according to Jakicic, but equally culpable is sleep sabotage. He believes that the more you’re awake, the greater the chance you’ll have an extra snack or two (or three or four). A 2013 study in the Proceedings of the National Academy of Sciences supports that theory. It found that people who don’t get enough sleep are more likely to be hungry because the body needs more energy to stay awake. Unfortunately, sleepy eaters tend to consume more than enough to compensate, which leads to weight gain. “People who are well rested don’t slog through the day,” says Jakicic. If your body is worn, you’re not going to be bounding up the stairs to your office, and you might be less motivated to make it to the gym. Less physical activity means fewer calories burned which, over time, can lead to weight gain. So if you suffer from insomnia, restless leg syndrome, fibromyalgia or any other sleep or pain disorders that can make shut-eye elusive, seek treatment. And yes, if you’re on a diet, getting quality, restful sleep can help you shed pounds, but it’ll take awhile. You can’t sleep yourself thin, and catching Z’s will never take the place of a healthy diet or exercise. Try to focus on the quality of your rest, not the number of hours you’re getting each night (within reason, of course). Founded in 1916, the Endocrine Society is the world’s oldest, largest and most active organization devoted to research on hormones and the clinical practice of endocrinology. Today, the Endocrine Society’s membership consists of over 17,000 scientists, physicians, educators, nurses and students in more than 100 countries. Society members represent all basic, applied and clinical interests in endocrinology. The Endocrine Society is based in Washington, DC. Overnight, there are two processes that cause you to lose water gradually. The first is respiration. Each time you exhale, you lose a little bit of water (exhale onto a cool piece of glass and you can see this moisture). The second is transpiration through the skin, also known as sweating. Over the course of a night, both of these processes eliminate quite a bit of water. Then there is the tradition of using the restroom prior to the morning weigh-in. That process can eliminate up to 1 pound (0.5 kilograms) of water. According to this water information page, the average person eliminates about 1.2 liters of water in urine each day, and also eliminates about 1 liter a day through perspiration and respiration. That’s 2.2 kilograms (almost 5 pounds) of weight fluctuation happening throughout the day!